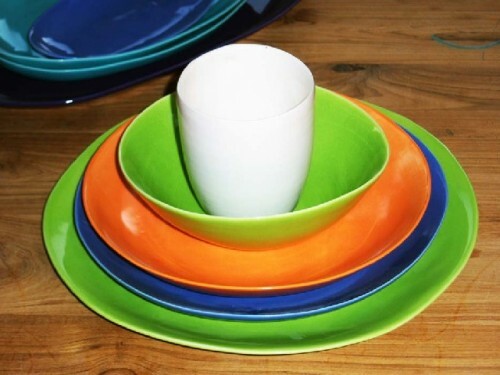 Fine dinner ware by Mary Anne Davis. Photographs by Astrid Hiemer. Mary Anne in her studio. 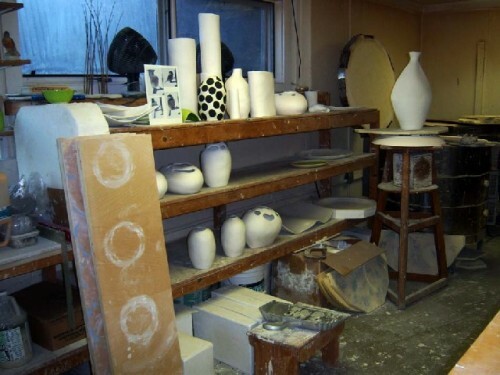 Work area in the studio. Drying shelves and two kilns. 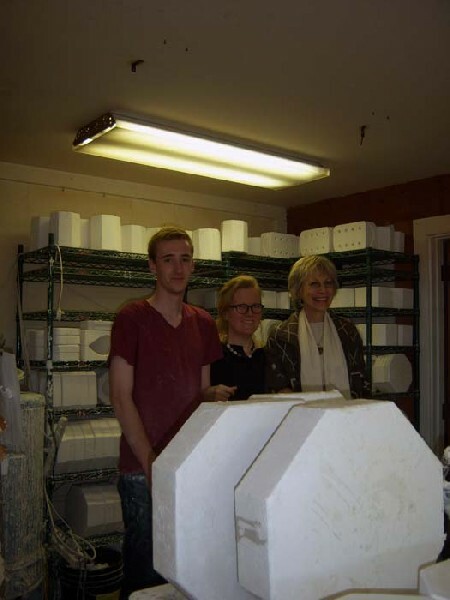 James, Mary Anne, Cheryl, and molds. Husband Dan and Mary Anne stepping out of the studio. This is indeed a thoughtful and high-minded statement. Davis' work has the quality and she has the reputation to back it up. She received a BFA (Bachelor of Fine Art) degree from Cranbrook Academy of Art, Bloomfield Hills, Michigan, and the University of Wisconsin, Madison, Wisconsin. For her MFA (Master of Fine Art) degree, she studied at the School of Visual Arts in New York City and at Urbino, Italy. Mary Anne has shown her work since the 1980s in numerous one person and group exhibitions. Here are only a few selected from recent years: Tinku Gallery, Toronto, Canada, with catalogue and essay by Elizabeth Hess, 2009; Mark McDonald, Hudson, New York, a comprehensive survey from the past ten years, with catalogue and essay by Linda Weintraub, 2005. Her bibliography, own articles, lectures presented nationally, and works in collections are impressive ! Group exhibitions for 2010: 'Creative Fidelity,' Stagira Studio, Austin, Texas; 'Stoked,' Art Omi, Ghent, New York; and 'What Matters Most,' Eco-Artspace, New York City; 2009: Ferrin Gallery, Pittsfield, Massachusetts. Other international projects include events at Gallery Idee in Tokyo, Japan and the Asia Society in New York City; a Christian Boltanski exhibition/project at South London Gallery, London, England; and the London Biennial. Over the years, she also participated at the Smithsonian Craft Show, Washington, DC, the Philadelphia Museum of Art Craft Show, Philadelphia, Pennsylvania, Craft Boston, Massachusetts, the American Craft Council exhibition in Baltimore, Maryland, and the New York International Gift Fair. There have been many articles published in all the right magazines: Elle Décor,'O' Magazine, Real Simple, Modern Bride, Gourmet, Bon Appetit, Style, and The New York Times. Fran Weinburg told us, that she had seen photographs from 'davistudio' dishes in the New York Times Magazine in 2001 and was intrigued. She was looking for dinner ware, but was not interested in a Rosenthal style. She followed the information from the newspaper and eventually found 'davisware' and Mary Anne. 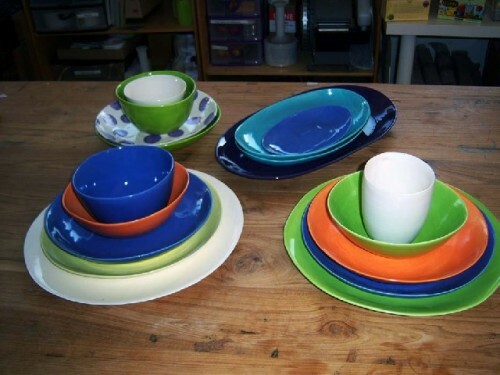 She purchased a set of ten, her most favorite and treasured dishes. Naturally, 'davistudio' line has been sold at: The Whitney Museum Store; The Guggenheim Museum Store; The Museum of Art and Design Store; The Guthrie Theatre; the Museum of Contemporary Art in Chicago; John Derian and Avventura, Neiman Marcus, Bergdorf Goodman, Gump's, and many more. The Food Network shows her porcelain on 'Everyday Italian,' with Giadda de Laurentis and '30 Minute Meals,' with Rachel Ray. 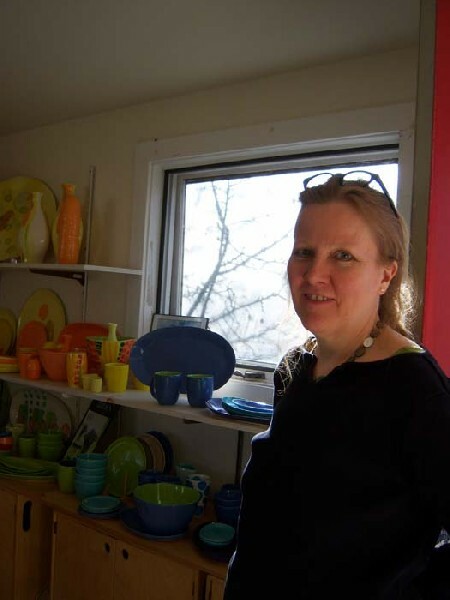 We were intrigued by the light weight and brightness of the colors of her irregularly formed dishes and enjoyed Mary Anne's open personality and enthusiasm that evening at Ferrin Gallery. Charles also bonded with her husband Dan Franck, who is the Senior Science Content Specialist at a publishing company for education books - on line. So, we drove recently to 'davistudio' in Chatham, New York. It was an extraordinary experience ! There, we were introduced to Cheryl Gilbert, who is currently advising Mary Anne to move forward with a specific business plan, and James Collier, her young and talented assistant. Dan came to the studio and finally, we also met their teenage son, Gabe, for a fleeting moment. The country setting was complete and as Mary Anne put it: 'When we moved here, we intended to fully integrate into the environment. And, I believe, we achieved that.' So it appears. 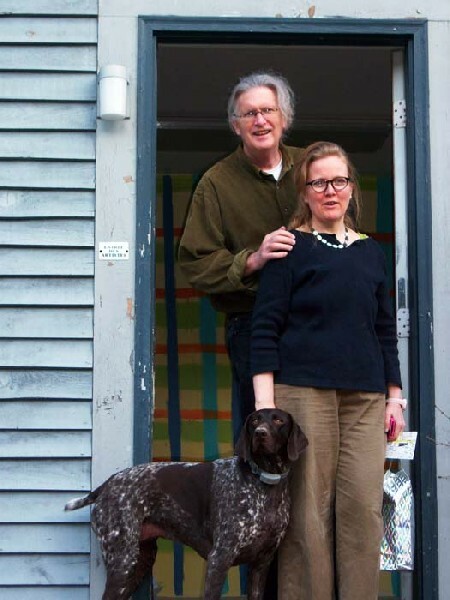 Davis established her studio ten years ago on the grounds of their home and it took a long time to set up in the way she works today. 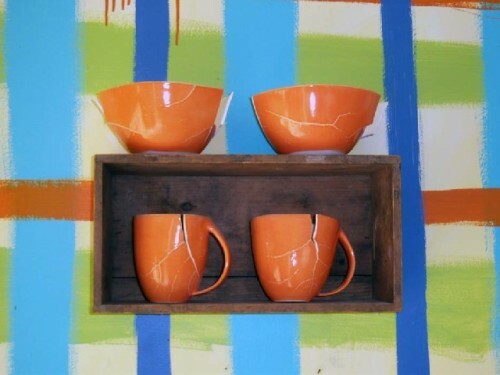 As one enters the studio, the eye is drawn to a brightly colored cross lined wall with a small shelve and a couple of beautiful orange colored mugs. But wait, they are artfully broken pieces a message from the kiln. 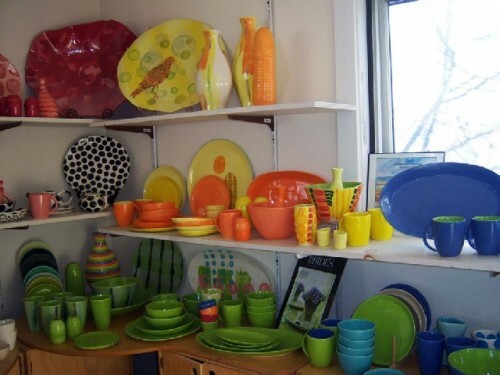 Then, to the left of the doorway, short piles in different sizes and forms: Various plate sizes, oval or round platters, bowls, cups, tumblers in shades of white, yellow, orange, green, blue, and purple Â– the colors of the rainbow. What a feast for the eye ! We assembled several combinations as individual sets of her porcelain dishes, which range from approx. $200 to $350. Davis has a bridal register set up on her website. In the next area she exhibits a few of her paintings. A table holds a number of vessels from her 'Sacred Waters' project and she noted that a museum should eventually acquire the vessels. Mary Anne wrote the following about the work: "'Sacred Waters' is the last piece of sculpture I made before leaving New York City for Columbia County in 2000. The series is inspired by issues surrounding water, political, and environmental health. The vessels suggest water and flow. Shapes, which fit together organically, have played an important role in my work since my early 20s. 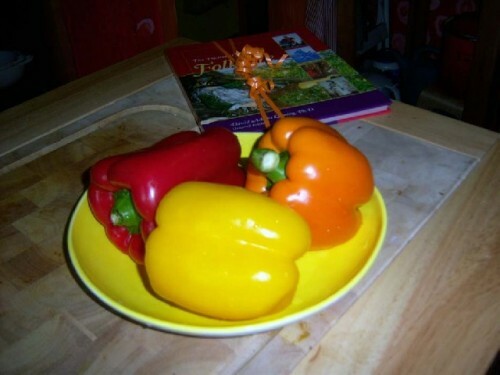 I am interested in: Integration, life and art, people and things, opposites and likes. Bio-mimicry. Blues. Droplet shapes. Two dimensions growing into three dimensions." In the rear of the building the view reaches far into the New York State country side and a magnificent tree formation in the distance. This is her office, thinking, and business space, where Mary Anne and Cheryl are currently preparing for a production expansion. She believes that she has reached that point in her professional life and work. Stairs lead down to the production floor, where James had set up a few plates above a water basin. 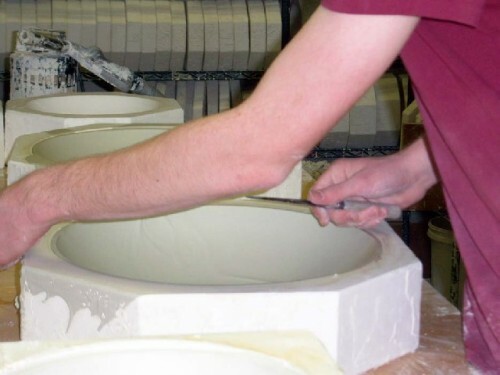 The slightly thinned porcelain slip is poured into a mold, excess material runs out, and additional drips discharge, while the plates are in an upright position, beginning to dry. Later, we watched as a couple of plate rims were cut straight and the plates released from the mold. Davis' dinner ware is intended to be slightly uneven in form, also a metaphor for life, which is not perfect ! 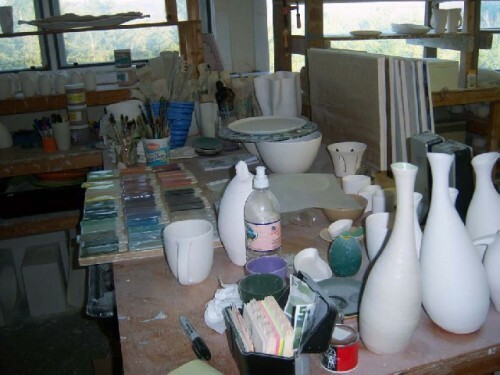 Dry pieces are first bisque fired, she applies the glazes herself and then they are fired again. 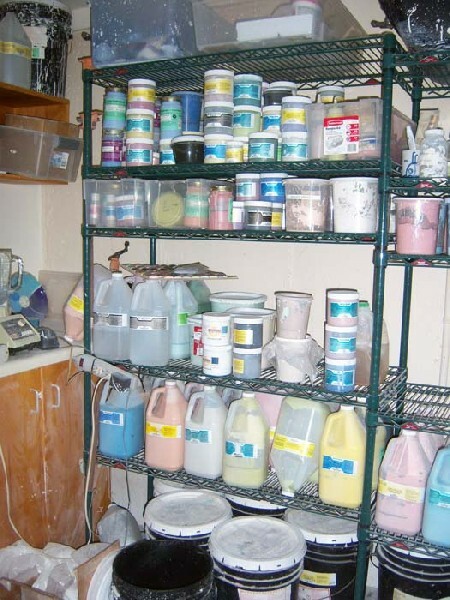 There are two kilns in the studio, which she uses weekly. 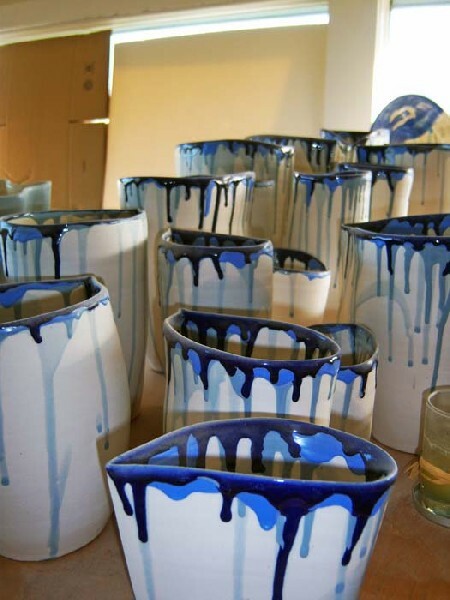 Davis was invited to create 200 bowls for the symposium 'Food and Power,' at The Copia Institute, Napa, California, in 2003. She participated with her work at three rituals or performances of Mala Meal Projects: At Art Omi, in 2002, The Earth and Religion Conference at Bard College, Rhinebeck, New York, in 2005, and at Digital Earth Conference, the University of California, Berkeley, in 2007. 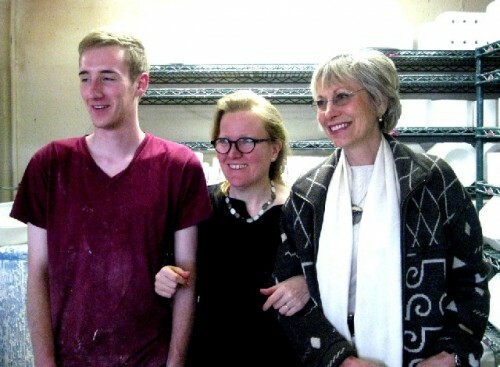 Perhaps, a next step as an artist and for 'davistudio' may be to collaborate with creative forces, such as Karin Bacon Events, The Art of Celebration, in New York City. The future for Mary Anne Davis lies as open as grand New York State vistas.